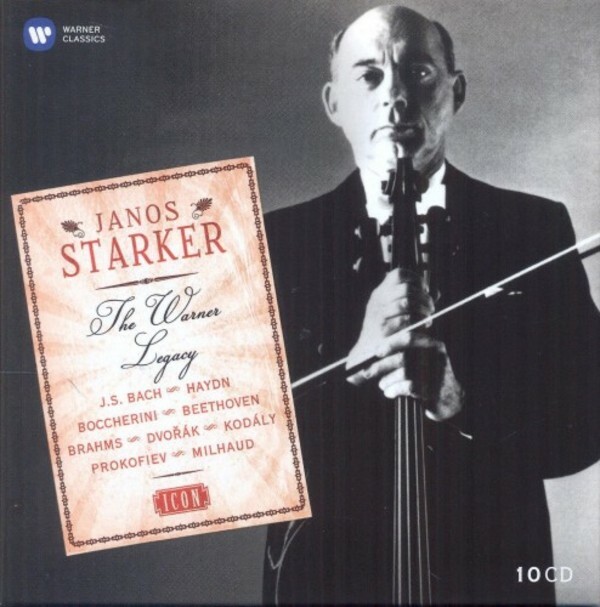 In the years from 1957 to 1959, producer Walter Legge had recordings made of the essential items in the Hungarian cellist J�nos Starker�s repertoire. This complete collection of his recordings for EMI and Erato represents the summit of Starker�s achievement on disc. Legge, a perfectionist and a ruthless critic, undoubtedly found in the restrained manner and inward-looking temperament of Starker an ideal talking companion, especially since the two men had a pronounced liking for caustic humour, and one can be sure that the stamp of the famous artistic director was constantly in evidence throughout the recording sessions. The listener will be surprised, on the other hand, when he hears again the first complete set of the Suites of Bach recorded by Starker (he was to record them twice more) by an approach which is much more committed and much more varied than memory will have led him to believe. The manner is of course apollonian, the playing both subtle and full of intensely personal accents, but it is the variation in tempo and the animation with which each Suite is charged that bring to the whole collection an unaccustomed depth, only otherwise to be found in the recent recordings made by exponents of the gamba. The Sonata of Kod�ly, recorded between sessions devoted to the complete Suites of Bach, is one of the rare recordings by Starker that reveal the technical mastery that the virtuoso had attained by the end of the Fifties. This electrifying production gives the lie to the legend of an exclusively intellectual and severe J�nos Starker and highlights one of the facets of an artist it is high time we rediscovered in all his varied dimensions. May this issue contribute to a revaluation of a remarkable musical personality.